HOME Downloads legal info Comment! Do you need good delay effects in your production? A Delay that supports filtering, ducking and reverse, that is synchronized with your musical tempo? A Delay, flexible to bend the input as much as it is needed for your production? TigerDelay, with nice sound results, yet easy to use, is the solution. Since Ducking and Reverse Delay is one of the most needed effects and I was reading in one forum that an effect like this is needed, here is the solution. Furthermore it allows filtering with a resonant filter so that the sound can be bended as much as you like. The filter supports even self-resonance. Actually this is the release 1.2, it was built using experience in JellyVST as well. The Signal is filtered with a flexible and resonant 24dB lowpass filter, then delayed and fed back. With the additional Ducking the dry/wet is regulated so that either the dry or the delayed signal is returned as result, based on wether there is an input signal or not. Since a picture says more than 1000 words, I put a screenshot here for the time being. Tigerdelay has been awarded with the Golden Award of euroDownload.com..
26 January 2007: Comment function available. Since now about 700 users have downloaded the TigerDelay fx I made a function in order to give comments which will send me an email function that is not deleted as spam :) You can go there with this link: Comment! 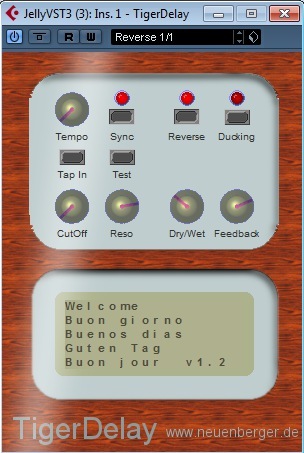 22 January 2007: Tigerdelay VST effect released! TigerDelay v1.0 is available as download! Have fun!